We woke up at 6:15, finished packing up our packs, checked out and walked briskly over to the train station, trying to stay warm in the cool morning air. We checked in and dropped our packs at the luggage drop, then decided to poke around inside the train depot and gift shop – bad idea. We entertained ourselves for quite a while, watching incredulously as the tour group walked around taking photos of quite literally every.single.thing. they encountered – the depot, the door into the depot, the tiles on the floor inside the depot, items in the gift shop, benches inside the depot, etc., etc. I giggled to myself as a small group stood in the middle of the road taking photos and nearly jumped out of their skin when a cabbie beeped at them as he sped by. The train cars were really cool! Each car was a double-decker. The downstairs was a diner area with four-person booths and big windows in each booth. There were also two small restrooms that were very clean and funtional; bigger than an airplane bathroom, but by no means spacious. The upstairs was a domed viewing area with all of the passenger seats. The windows extended from the sides up and around overhead giving exceptional views both outward and upward. There were only 4 seats per row – two on each side of the aisle – so unlike airlines, it was very easy to get up and move around and/or see out the windows. 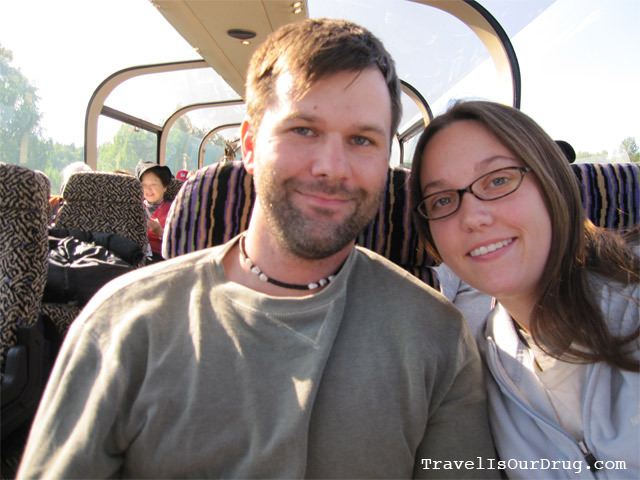 We were in seats 10A and 10B – about half way back on the western side of the train. We did eat a meal as part of our trip on the train. It was not included in the cost of the ticket, and was fairly pricey, though not astronomically expensive. The meals were served on a rotating basis, as there weren’t enough seats downstairs for everyone. We were one of the last to be served, so we got a bit impatient as we got hungrier and could smell the food wafting upstairs. We were seated with another couple, which had the potential to be a bit awkward, I guess, but we enjoyed the conversation. K and I both tried Alaskan king crab cakes to compare to the Maryland blue crab cakes. I have to say, for train food, it was pretty good, but we’re both still partial to the MD crabs. 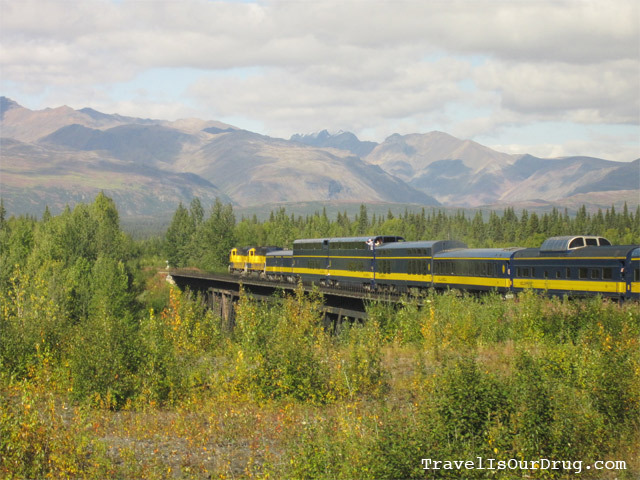 We purchased our round-trip train tickets as a buy-one-get-one deal through the Alaska Tour Saver, so for $350 total, we thought this was a really great deal. We had comfy seats, and beside the chatty, overbearing tour group patrons, it was quite relaxing and enjoyable. We didn’t have to worry about driving, we could both sight see, and if we wanted nap. We also had guides on board that shared a lot with us about the area. 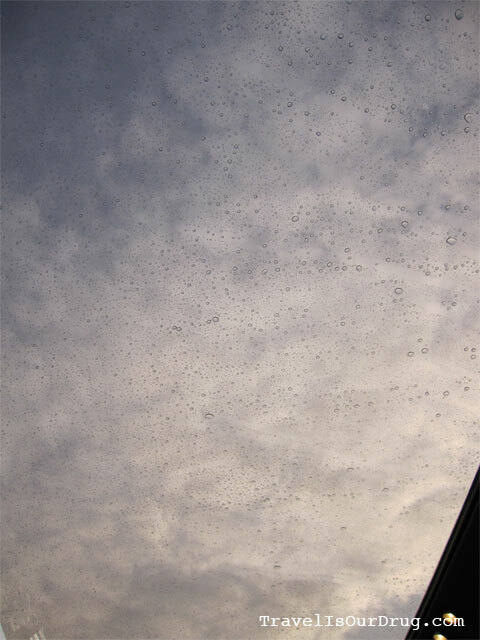 As we pulled away from the station in Anchorage, the overhead windows were covered in a tight pattern of raindrops. There were quite a few grey clouds up high in the sky with the sun trying to break through. The views were the same ol’ thick brush and trees. As we got a few miles out from the station, there were amazing views of Cook Inlet. At this point, the tide was in and we saw the water against the land. Our guides told us that Cook Inlet has Bohr Tides where the tide shifts up to 30-40 feet in a matter of minutes, making it incredibly dangerous. When the tides are out, the bed is covered in glacial silt, which can act as quicksand. People and animals both naively make the dangerous walk out onto the bed and are killed as the tides race back in and they’re trapped in the silt. A little further out, we came to Wasilla – obviously well known recently for Republican VP nominee Sarah Palin. 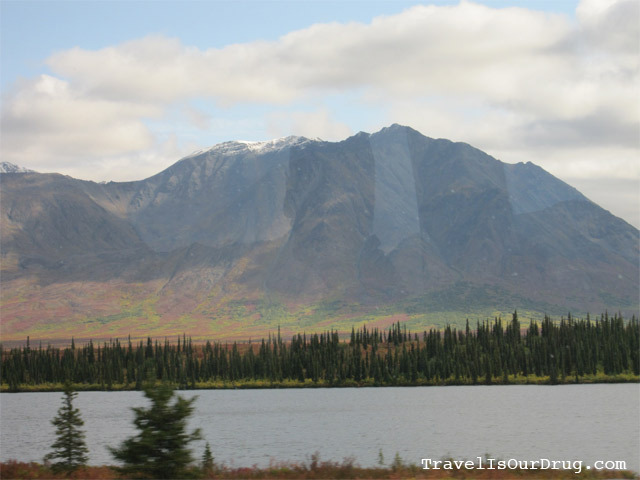 Wasilla is a small suberb of Anchorage with many chain businesses sprinkled amongst the small-town, private businesses. Another claim to fame for Wasilla is the official “restart” position of the Iditarod – up until 2009 when it was moved. They used to do the start in Anchorage for show and photos and then moved to Wasilla for the official time-keeping start. 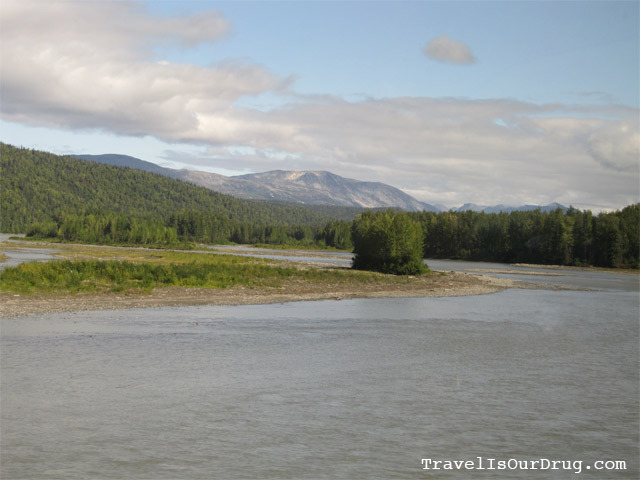 Outside of Wasilla, we passed a lot of trees, dead and somewhat petrified – much like the ones we saw through the Yukon. 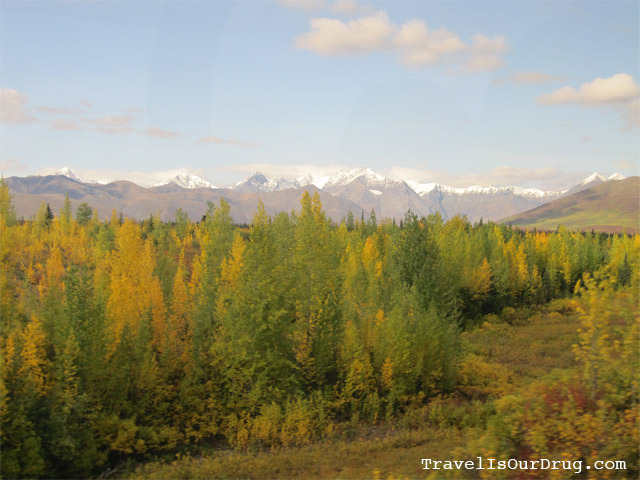 These trees were actually killed as a result of a 1964 earthquake whose epicenter was several miles outside of Valdez, AK. The quake was so strong that it destroyed Valdez and Cordova and severely affected Anchorage and Seward. It also affected places as distant as Hawaii and Japan. As the ground shook and split, saltwater rushed in, killing the trees and leaving them standing, petrified. Several miles down the track we saw a similar patch of dead trees, which the guides said weren’t due to earthquake damage – they were a result of permafrost under the ground surface. A significant portion of the ground stays frozen year round, some close to the surface, some further down. When the roots of the trees hit the layer of permafrost they can’t expand and results in either death or severely stunted growth of the trees. Probably the case with the trees we saw in the Yukon. As we continued, the day grew more and more beautiful. The morning cloud cover burned off, giving way to beautiful, clean blue skies and full-on sunshine with not so much as a cloud in the sky. The weather was absolutely perfect and we were able to get clear views for what seemed like forever from the train windows. 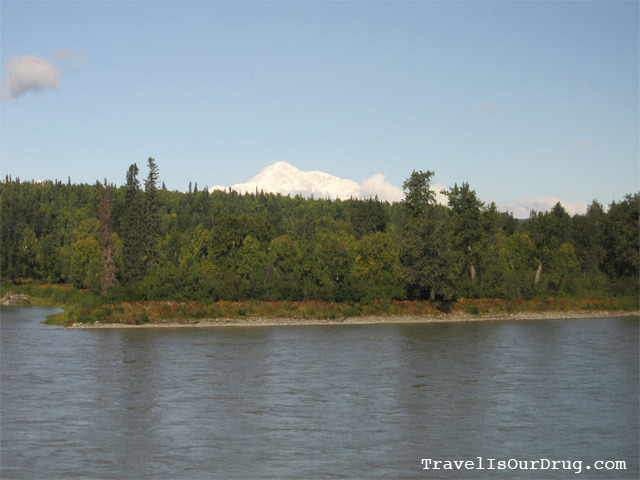 We had great views of the four mountain ranges surrounding Anchorage – Chugach, Kenai, Talkeetna and Alaskan. 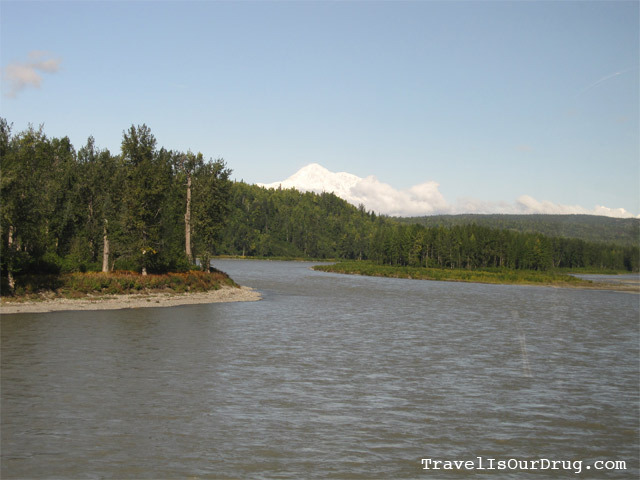 We also had great views of several rivers – predominantly the Susitna – as well as many, many lakes and ponds. Unfortunately, not a single wildlife sighting. SO disappointing. 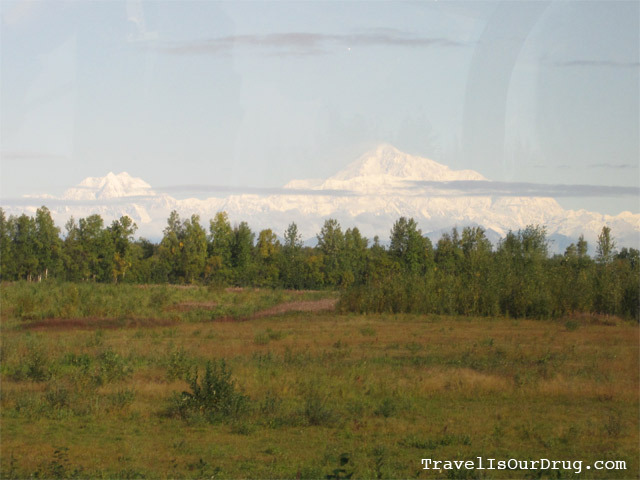 Just south of Talkeetna, we got our first full view of Denali – both peaks, completely unimpeded without a cloud in the sky! Just under 1/3 of all Denali visitors actually get a full, clear view of the mountain, let alone under perfect weather conditions and cloudless skies, so this was pretty amazing! We caught the first glimpse between patches of trees and the train quickly ducked back into the trees making views infrequent and photos impossible. 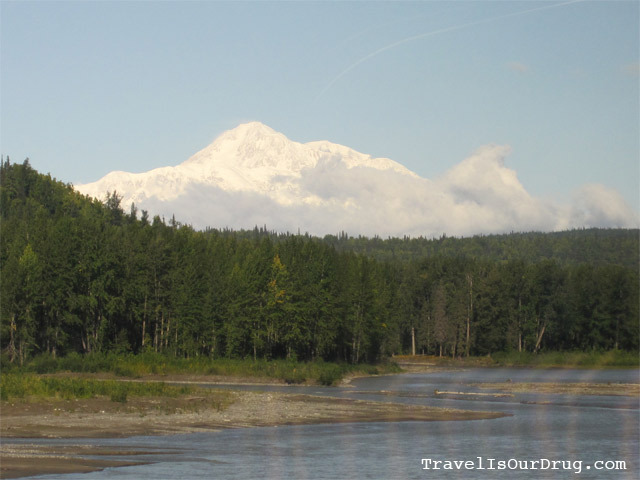 Our guide promised that up closer to Talkeetna we would get great, clear photos of the mountain – IF the weather was on our side and the peak stayed out that long. 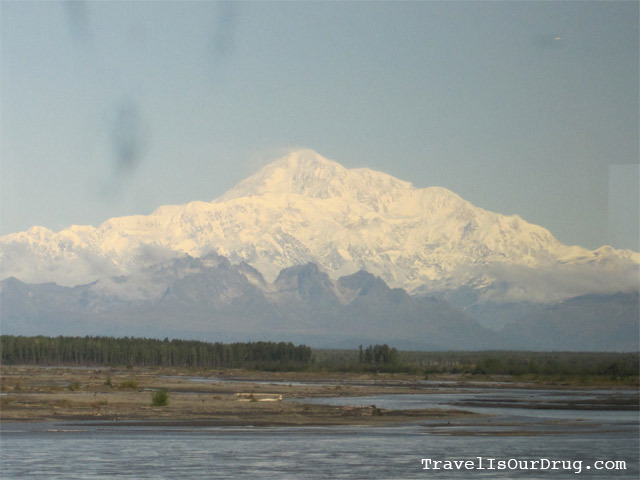 The peaks of Denali are actually so high that they tend to form their own weather systems, so it is highly possible that the peak could be openly visible in one moment and completely clouded in, in the next. I think we all held our breath up to the point nearer Talkeetna, praying for a clear view, and amazingly, there the peak still was, clear as day without even the smallest threat of cloud cover. I got a ridiculous number of photos – some to prove we’d seen it, and others desperately trying to capture every tiny detail of the incredible, natural wonder in front of us. The gorgeous blue skies provided an excellent contrast to the snow-capped peak. It was amazing to just sit and observe the difference in altitude between Denali and the surrounding peaks, as well as the drastic changes in cloud formation and cloud cover minute to minute. I was in complete awe of the sight and quickly dropped the camera to silently absorb every tiny detail of the gargantuan in front of me without the distraction of zooming and focusing just so to catch a flawless shot. Regardless of how beautiful any photo I took came out, the images in my head will always be far superior. 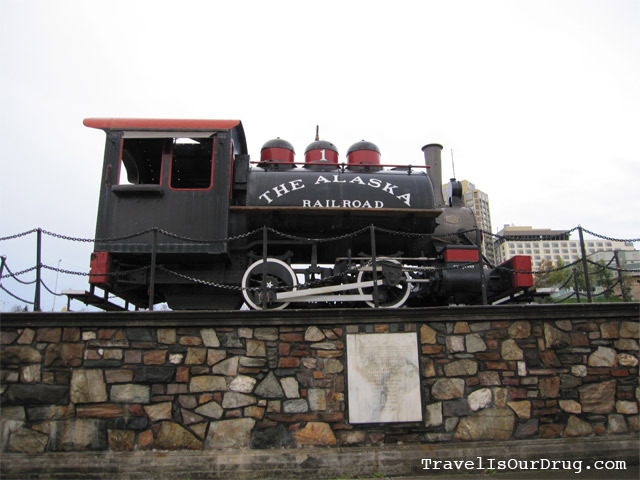 We passed through several tiny, tiny towns that were once important stops along the railroad, particularly before the development of the steam engine reduced travel time between Anchorage and Fairbanks to less than a day. North of Talkeetna, there were several homes unreachable by any road or vehicle. 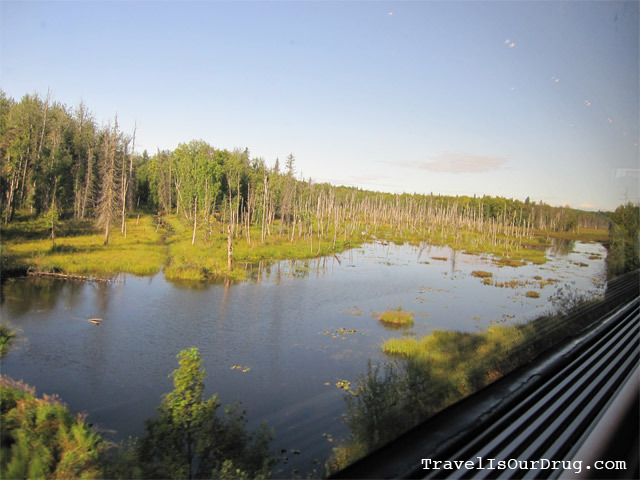 The only way to access most of these, other than by plane, is the flagstop train, which runs from Talkeetna up the tracks to Fairbanks and back down. The train runs once or twice a week, depending on the season; north one day and then back south the next. Residents along the rail can walk down as the flagstop train passes, wave a flag and hop on board. Most of them keep cars parked in Talkeetna or Fairbanks to do shopping, etc. as needed, then have to lug all the stuff they bought onto the train and back up to their houses from the track. It’s a crazy lifestyle – most still have outhouses and some still don’t even have electricity – but ti’s completely self-chosen. As absurd as it seems, I can see the appeal and romantic aspect of the absolute basic simplicity of being left to nature, books and your own thoughts. It’s so much less materialistic than the lifestyle the gross majority of Americans are accustomed to and amazing to me that people in the US still live so minimally and naturally. I wouldn’t mind trying it for a bit. 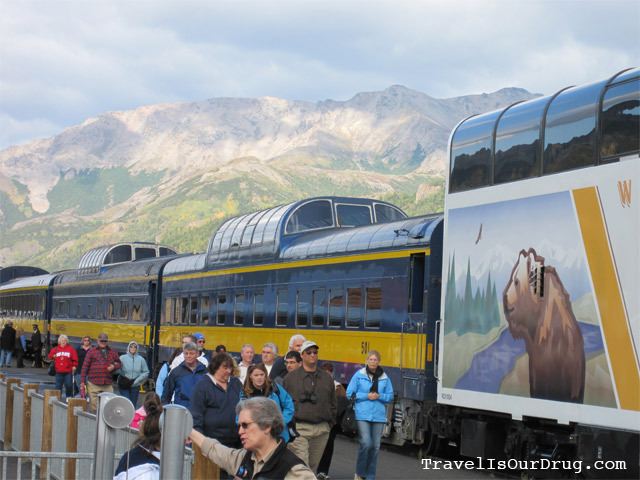 As we chugged along, it took me a bit, but I was finally able to catch a photo of the front of our train with the mountains in the background as we rounded a bend in the tracks. The mountains almost look fake in the background, but I swear these photos are all unedited! 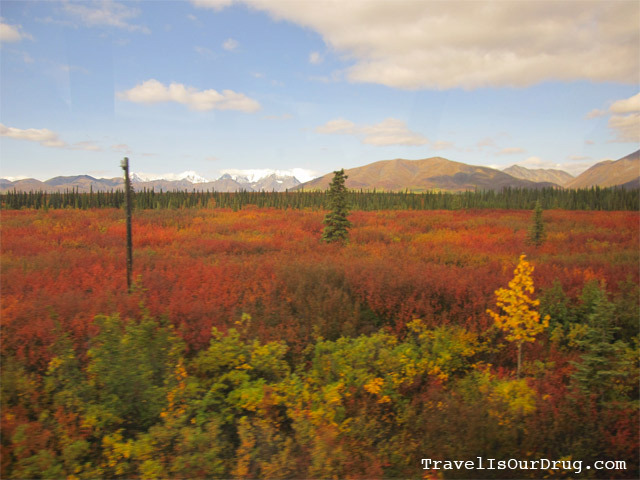 As we proceeded north even further, the vibrant colors of fall began creeping in. 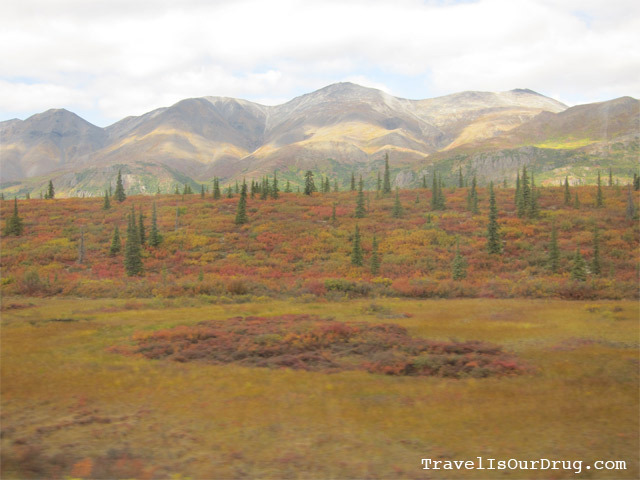 First we saw just a few colors here and there, then all at once, the birch trees were bursting with bright yellow hues and deep, brilliant reds exploded from the blueberry bushes blanketing the vast tundra on either side of us. The colors set such a stark contrast between the sparkling blue tundra ponds in the foreground, the rolling green mountains in the background and the jagged, snow-capped peaks in the even further distance. It was all so breathtakingly beautiful and difficult to capture in photos. 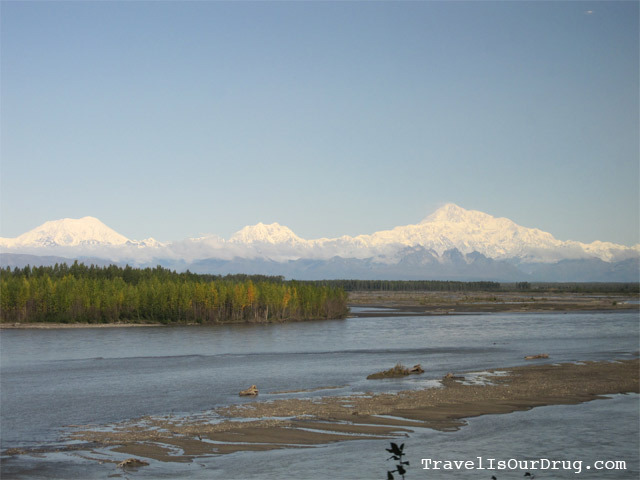 After 8 hours, we finally arrived in Denali – to stunningly gorgeous views and weather. We grabbed our packs and headed straight to the Backcountry Information Center for our backcountry permits. We found out there that we were too late to go out tonight, as the camper bus is the only way past the first 15 miles of the park. The last one for the day left at 5:00 and it was 4:30 when we arrived. So we went ahead and picked out our zones for the next three nights – Zone 11 in Stony Dome for one night and Zone 43 in Kantishna for the next two. We watched a mandatory safety video and completed a safety briefing focused on making sure we know to avoid and/or deal with wildlife encounters with moose, wolves, black bears and grizzlies. Then we got our bear canister approved and finally got our camping permits. Side note: If you are backcountry camping in Denali, you have to pick your zones ahead of time. They only allow a certain number of permits/people per zone, per night, and you can be ticketed if the rangers find your tent in a zone other than where you’re scheduled. You must display the permit on the outside of your tent at all times so that the rangers can easily confirm your allowance to be where you are if you are not in the tent. The zones can only be reserved up to one day before your trip departure, AND have to be reserved in person, so no calling ahead. Backcountry passes are also free, which is nice if you’re skilled and savvy enough to make it in the backcountry since you have to pay for a campsite at all of the established campgrounds in Denali. I found it helpful to research all of the zones here, and we prioritized our top 4-5 before arriving. Luckily for us, we got our first choices. Also note, you’ll need to either bring a bear canister, or rent one from the Backcountry Information Center. If you don’t bring one with you, be sure you have enough space in your pack when you arrive to fit one in. They’re not small. After securing our camping passes, we headed to the Wilderness Access Center to reserved a campsite for tonight, pay park entry fees and buy camper bus passes. The total of everything was $96. Since we’d missed the last camper bus, we had to stay within the first 15 miles of the park tonight. 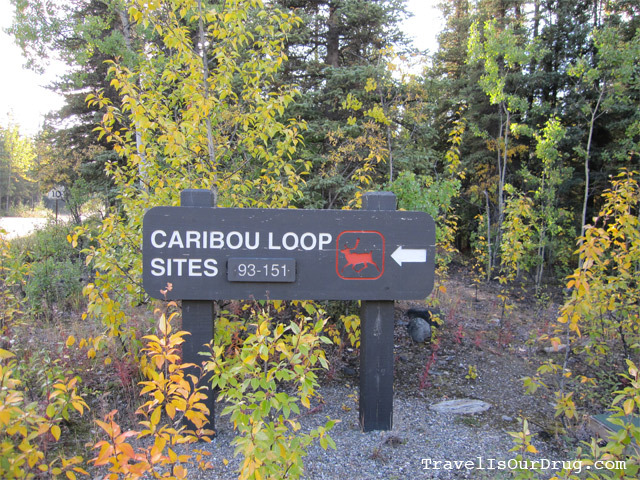 The only site available was Riley Creek Campground – literally right inside the park. We reserved a walk-in tent site and seats on the 7am camper bus for tomorrow and walked over to the campground. A couple of good things about camping here: Riley Creek is the only campground in the park that allows fires, and the site also has bear lockers. The bear lockers were pretty key since we still had too much food and crap to fit everything in our bear canister. We still needed to eat some food out of the canister to fit our extra granola bars and toiletries. So tonight we were able to just stash them in the locker outside of the canister. 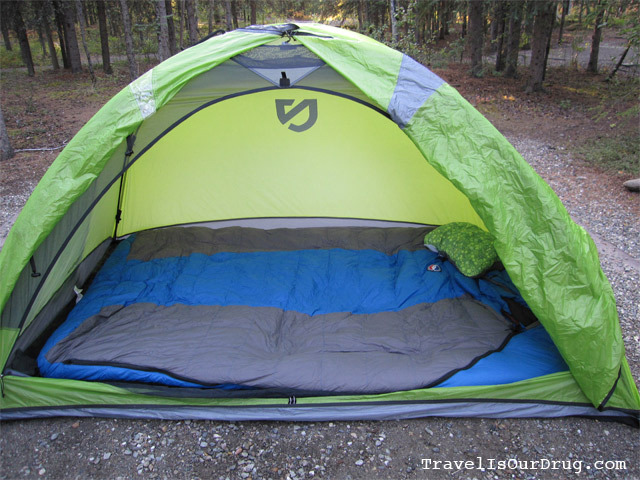 First things first, we set up the tent, sleeping mats and sleeping bag. It was quite a chore keeping all of the mischievous little squirrels out of the tent while we set it up. Once everything was all set up, K cooked us dinner in the tiny kettle from our mess kit on our dinky little burner stove. It took forever to get the stupid thing lit and another eternity to heat the water. I hope this isn’t a sign of how crappy this thing will perform for the rest of the trip. (I wish we’d just sucked it up and shelled out the money for a jetboil.) K got impatient and dumped the pasta into the pot before the water started boiling. The end result was mushy, nearly liquefied mac n’ cheese with some cheese-free patches and quite a bit of pasta plastered to the bottom. Not the greatest meal in the world, but by this point we were both super hungry and scarfed it down anyway. The restroom facility had a small sink with running water outside where we were able to clean up the dishes and fill up with some drinking water before packing everything back into the bear lockers for the night. After dinner, with not much else to do, we decided to start a fire. While K had cooked dinner, I had walked around picking up sticks for the fire, but a lot of them were pretty wet and not big enough to make a good fire. So we walked back over to the mercantile to buy a cord of wood ($8) and also bought a nice pair of gloves for each of us ($10). We were able to get a pretty good fire going, thankfully, ’cause it’s getting cold out here! The last of the firewood is burning out. It’s 10:30 and just within the past 10 minutes or so gotten dark enough for me to need my headlamp to keep writing. K’s putting the fire out, and I’m heading into the tent to bundle up and get ready for bed. We have an early bus to catch tomorrow morning and a lot to pack up before heading out.